Mayor McCarthy has finally stated that having a casino “is not without risk”, but he offered no suggestions on how to reduce its likely negative impact. Instead, he continues to distort or ignore facts to defend the unnecessary pylon sign. The Mayor’s comparing the unsightly and hazardous pylon to the GE sign should make us shudder. The circular GE logo is 36′ in diameter, which means it is less than half the height of the 80′ Casino Pylon and three feet narrower, and is only slightly taller than the 32′ LED screen, which will be far more intensely lit and directly aimed at Erie Blvd. traffic and drivers on the new rotary. More important, the GE sign is distant from traffic and residences, and not merely a few yards from Nott and Front Streets and Erie Blvd., and short blocks from several neighborhoods. 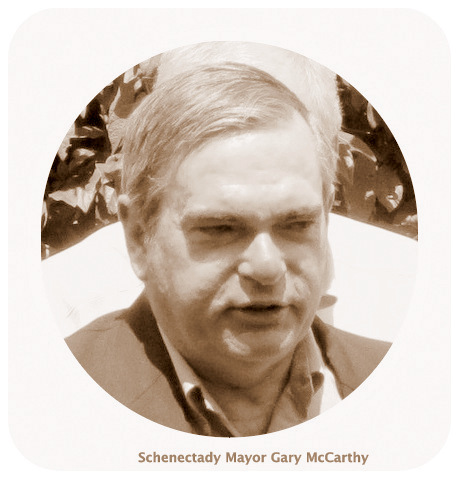 Even worse, the Mayor confirmed for us that the Casino Pylon Monster has the purpose of “branding” Schenectady as a Casino City, by saying the GE sign did a good job of branding our City. I am proud of Schenectady’s relationship to GE, but having the Rivers Casino sign as the symbol of our City — which is clearly the goal of Rush Street Gaming — will be a source of embarrassment for myself and the majority of people of our City and County. The Mayor also again denigrated those of us who are working to protect the residents of our City from negative Casino effects such as increased problem gambling, crime, bankruptcy, family violence, traffic hazards, and disruptive lighting, by saying there are people who had opposed the casino and are now “trying to slow or even stop it.” He indicated that the process of approving the Casino has been open and that every time there has been a public hearing changes have been made in response to public comments. That is a very different history from that chronicled here. As the Gazette reported, Roger Hull said “Why does one need to have a sign that size? It’s not like people are going to be unaware of where the casino is.” But, Hull avoided a question asking whether the Casino should be required to comply with a maximum brightness rule during overnight hours. He also avoided a softball question asking whether the Planning Commission should be given the authority to fund independent studies of complicated issues, rather than merely accept the assertions of applicants such as the casino. Instead, Hull seemed to suggest that the Planning Commission was still “looking into” issues such as the height and location of the pylon sign. In fact, the Commission has already decided on the size and location of the pylon (accepting Rush Street’s proposal), and will apparently only be considering relatively minor design questions. follow-up (6 PM, Sept. 22, 2015): Talk of open government is refreshing but, as I stated in a Letter to the Editor published last Sunday in the Gazette (“Planning commissioners must have gumption“, September 20, 2015), transparency is a prerequisite for good government, but will mean little if our administrative and quasi-judicial bodies, such as the Planning Commission and Zoning Board, do not demand full information from applicants, obtain independent expert studies as needed, ask tough questions, and engage in full, independent deliberation before making decisions. The text of the Letter is immediately below. Faced with a structure wider and twice as tall as the famous GE logo, the Planning Commission has a duty to decide on its size, location and design in a manner fully open to the public. But the outcome of that process is unlikely to protect our residents and city, or fulfill the requirements of an effective site plan review, if the nine Planning commissioners have not armed themselves with the information and courage needed to make a careful and independent decision, rather than merely applying a rubber stamp with no true deliberation. They have not demanded information crucial to understand the effects of the proposed pylon sign structure on residential areas, on traffic and pedestrian safety, and on the city’s skyline. Such information includes a detailed rendition of the actual V-shaped pylon structure Rush Street says it will build (meaning two monolithic wings, each having a 32-foot tall LCD screen aimed at traffic), with a perspective showing the pylon in relation to Nott Street, Front Street and Erie Boulevard; and a Visual Impact Analysis testing the applicant’s claim that the towering, brightly illuminated structure will not disturb traffic or residential areas. They do not ask the most obvious of questions when confronted with the baseless claims and excuses of the applicant, nor discuss alternative locations, or issues raised by the public. Mayor Gary McCarthy, Metroplex Chairman Ray Gillen, and the casino spokesmen treat the commissioners like ventriloquist dummies. What we need are commissioners who will not be silent or have words put in their mouths, but who will at the very least act with the common sense and gumption of that other McCarthy — Charlie. Better yet, they must stand up and insist on transparently doing the job they are obligated to do under the Zoning Code. For more, please see http://tinyurl.com/pylonposting. This entry was posted in politics, Schenectady Casino by David Giacalone. Bookmark the permalink.